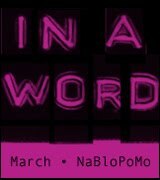 Is it wrong that the first thing I do upon successful completion of March NaBloPoMo is to not blog? While some would say that's actually a blessing, I do have a valid reason for this blogging neglect. And it was a fun reason too. Yesterday the lovely and talented Mutford clan graced us with a sleepover visit on their way home from New Orleans. While they slept, we managed to drum up a pretty impressive snow storm in a valiant effort to keep them with us for an extra day, but alas they outsmarted us and kept those planes flying somehow. Naturally we forgot to dig the camera out from its home in the junk drawer, so all we have are the memories tucked into our grey matter. Those, and the thoughtful gifts they brung - a novel, Liquor, by the New Orleans author who sports the delightful moniker of Poppy Z. Brite, and an intriguing art of train hopping DVD. Now I feel sort of bad about trying to steal John's watch. We had a great time, once again. It was great to finally meet the spousal unit, the slightly retarded kitty, and the 8-legged neck masseuse. That you risked life and limb to get us to the airport doesn't support your so-called efforts to get us to stay, but it was appreciated! Now we need to to return the favour. Yellowknife's not exactly a stopover, but you don't have to be passing through on the way to Inuvik to pay us a visit! What does one feed a Mutford? Glad you guys had a great visit. I am jealous! I arranged for the arachnid massage specifically for you, John. En route I was contemplating driving the Urban Assault Vehicle (Macho Version) into the ditch just to force another Mutford evening, but realised that would be selfish. The SRK slept until 4pm and then starting looking for the kids. We might even bypass that planned midwinter vacation to the beaches of Inuvik just to spend time with the Knifers. That is the eternal question, Al. I'm starting to realize that the answer is "pretty much anything". Were your ears burning? They should have been. Yes, I had hoped for roasted Allison ears. Alas, the Mutfords had ribs instead. Presumably not yours. How lucky for them and for you, except for the snow part. Sometimes I think you go too far at trying to make people feel at home Barbara! See? I knew I had forgotten something in the microwave, John! When you come to visit, I am going to try to change our Mayor into a reactionary right-wing bigot to make you feel at home, Dale. Not related to your post here, but I've been thinking of you a lot lately. Asking myself if I'm a man or a bag of sand & whatnot. I do think of the coolest people I know when I think of the creativity to which I aspire. Me love you long time, Barbara. You are certainly no bag of sand, Phlegmmy! Oddly enough, a question I often ask myself. And you certainly suffer no lack of creativity all on your own.